The crowd starting to trickle in for CDN's 2018 Top 100 Solution Providers gala on Apr. 25. The Canadian IT channel reached record milestones in 2017 and what better way to celebrate those accomplishments than at an event surrounded by the people that made it happen. 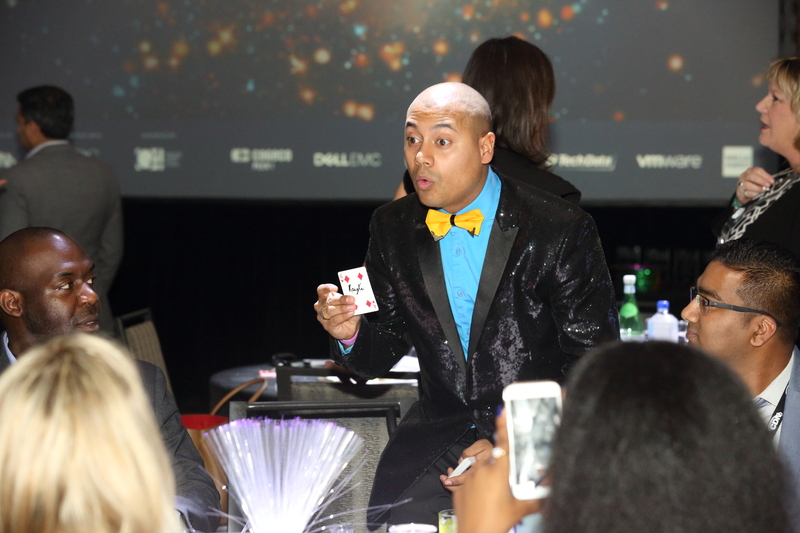 CDN hosted its annual Top 100 Solution Providers gala on Apr. 25, which saw more than 250 channel executives and tech leaders attend the successful evening hosted at Paramount Event Space in Vaughan, Ont. Following the ‘magic’ theme, first-time hosts Mandy Kovacs, associate editor of CDN, and Brian Jackson, editor-in-chief of IT World Canada, opened the show with a little help from Google Assistant, who told some interesting (or groan-worthy, depending on your perspective) magic-related jokes. Kicking off the event was a workshop focusing on how to attract more women to the sales channel, led by TalentMinded co-founder and CEO Kim Benedict. In the wake of the #MeToo campaign and revelations of rampant harassment in various industries, the IT sector needs to do a better job of fostering a more inclusive, gender-balanced ecosystem. Benedict shed light on how organizations can to do that by exploring business recruitment processes and how to find the right talent. TalentMinded co-founder and CEO Kim Benedict talking to the crowd about how a diverse workforce is good for business. Lending some excitement to the night was magician Edllusion. He showed off his “mingle magic” prowess by treating the crowd to some incredible tricks throughout the evening and finished it off with a magical performance of illusions with the help of a few audience members. Edllusion entertaining the crowd before the award ceremony. And with some fresh faces hosting the show, CDN decided to do something different at the 2018 Top 100 gala. For the first time ever, attendees were shown videos of channel executives playing “2 Truths and a Lie” and were able to vote in real time for the correct answer, which was revealed once all the votes were in. Almost every single person participated in the fun exercise and let those in attendance get to know some of the channel’s leaders a little better while keeping the show light. Greg Myers, Lenovo’s now-retired Canadian channel chief, was awarded a Lifetime Achievement Award for 36 years in the channel. He took the stage thanking those who helped him along his career, and left the crowd with some thoughtful parting words. 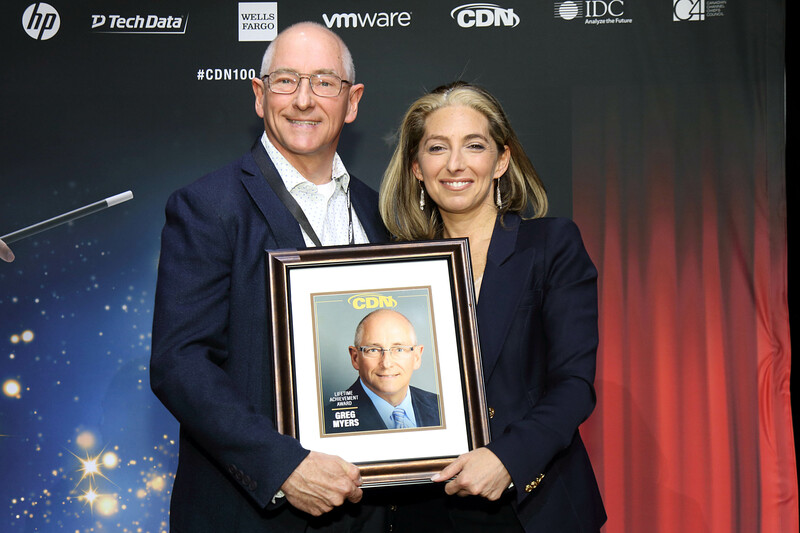 Greg Myers accepting his Lifetime Achievement Award from VMware’s Tara Fine. Moving on to the awards portion of the night, CDW continued its dominance by taking home first place for the fifth year in a row. The distinction was no surprise to vice president and general manager of CDW Canada J.D. Hupp, who came to the event confident in his company’s performance this past year. Softchoice followed closely behind in second, Compugen was third, and OnX (recently acquired by Cincinnati Bell Inc.) took fourth – each company retaining its ranking from the previous year. Compucom pulled into fifth spot thanks to double-digit growth in its revenue. Data collected for the rankings was verified and analyzed in partnership with IDC Canada, a leading technology analyst firm. 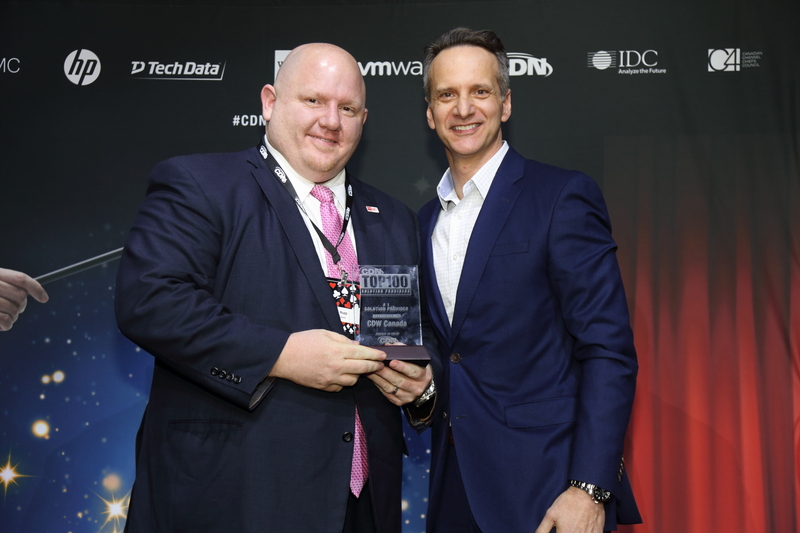 CDW Canada’s VP and GM JD Hupp accepting the company’s #1 ranking on the Top 100 list from Tech Data’s Ed Galasso. You can find the full Top 100 list here and the category award winners here. Individual profiles will be coming soon in CDN’s upcoming digital magazine on May 16. 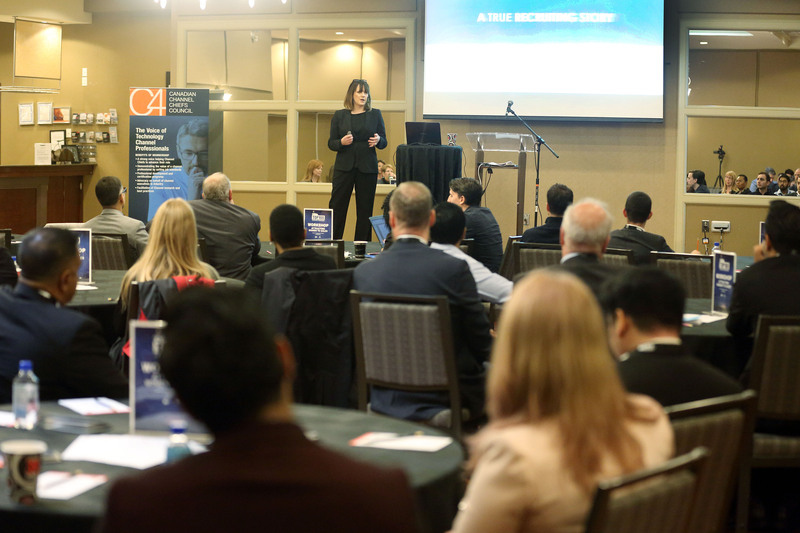 The show wouldn’t have been a hit if it weren’t for CDN’s incredible sponsors, Tech Data, Cogeco Peer 1, Dell EMC, IT Cloud, HP Inc., Jolera, VMware, and the Canadian Channel Chiefs Council, in addition to Wells Fargo, who provided all the food throughout the night.